The Labour MP told Brexit minister Dominic Raab he had been told Mrs May’s proposals were “dead in the water” by EU negotiator Michel Barnier. When pushed on more information, he said he had been told “les propositions song mortes”, which translates as “the proposals are dead”. However the EU has quickly dismissed the accusation, saying a recorded transcript will prove Mr Barnier said nothing of the sort. Asked about the comments last night, European Commission spokesman Margaritis Schinas said people should wait for the official transcript of Monday’s behind-closed-doors meeting. He said rather than dismiss Chequers as dead, Mr Barnier had actually raised several “positive elements”. Regarding the “dead” jibe, he said Mr Barnier said nothing of the sort and the official minutes would show this. Mr Schinas said: “Michel Barnier was very clear expressing the Commission position on Chequers from the very first moment. “I don’t think that people present in the room and beyond the room have any doubt on what we said on Chequers. But relations again soured yesterday when Mr Raab and Mr Barnier appeared to have a fiery confrontation during talks in Brussels. 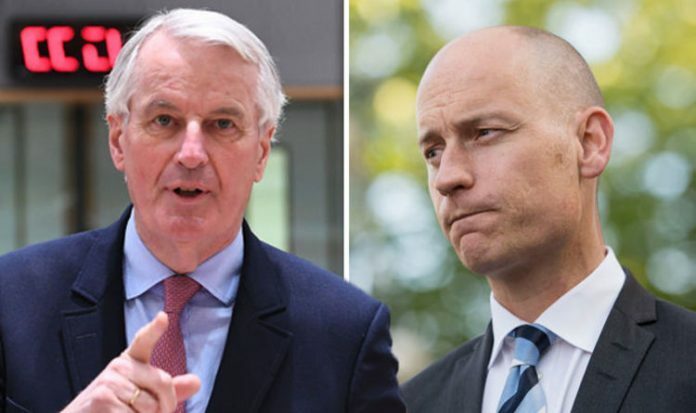 Brussels sources said the pair clashed over the border issue at a highly-charged meeting in Brussels and that Mr Barnier was “absolutely furious”. Progress on the Irish border issue since then has been “close to zero”, they said. Mr Barnier has repeatedly rejected UK proposal for avoiding a hard border such as using technology and exemptions to create an invisible border or a “dual tariff” customs partnership. Senior EU officials have dismissed both suggestions as “magical thinking” and “unicorns”.